To make a tax deductible donation, click here. The hottest topic in advertising and marketing today is “Green.” The auto industry has introduced alternative fuel cars, architects design Leeds certified “Green” buildings, manufacturers promote “Eco-Friendly” merchandise and packaging and organic produce is crowding grocery store shelves. 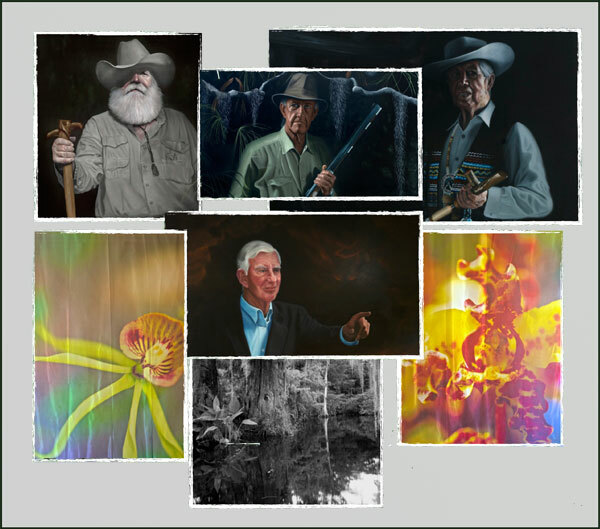 Now your company has an opportunity to sponsor an innovative, multi-media art-for-conservation exhibition, Guardians of the Everglades®, which focuses on the survival of the Florida Everglades. In July, the President said he is making “restoring the Everglades a national priority.” Show your customers and clients that the Everglades is one of your priorities by supporting this unique, creative approach to the conservation of this vital, yet severely threatened, ecosystem. Click the video to watch it here, or see it on YouTube or Vimeo. Central to the multi-media exhibition and documentary are Nicholas Petrucci’s 72 x 42 inch portraits of living individuals dedicated to protecting the Everglades, photographer Connie Bransilver’s eight foot silk prints of native orchids and other endangered species, and photographer and Everglades Guardian Clyde Butcher’s immense landscape photographs. Images of moving water projected onto the floor and video clips that bring the guardians and the landscape alive add to the excitement of this Everglades experience. For detailed sponsorship information: Please contact guardiansoftheeverglades@gmail.com.